supply for a family of four (3 meals a day). And don't forget about water purification. At the top of the survival kit gear is water and food. it'll be the best thing you ever had if you're starving. #4: Beef Slices in BBQ Sauce or Omelet with Ham. #5: Beef Stew. #6: Frankfurters or Chicken Al La King. #7: Beef Stew or Turkey Diced with Gravy. #8: Ham Slice or Beef Diced with Gravy. #9: Cooked Beef or Chicken Al La King. #10: Meatballs and BBQ Sauce or Tuna with Noodles. #11: Chicken and Rice or Ham Slices. #12: Beef Ground with Spiced Sauce or Chicken Loaf. Individual meals with accessories packet (silverware). Note: appearance may vary- clear or brown pouches. 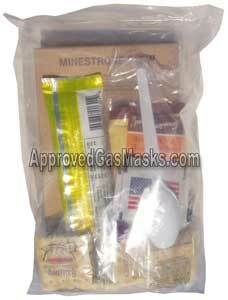 temperature variations that occur in the facilities where MREs are stored it is often impossible to determine actual shelf-life. Shelf life is more predictable where a climate controlled environment is maintained throughout the entire life of the product. recommended as rough handling of a frozen package can result in broken seals and food spoilage. Meals-Ready to-Eat are back in stock and as low as $4.77 each!